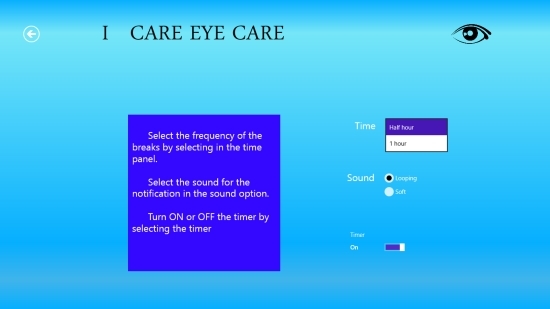 I Care Eye Care is a free Windows 8 Break Reminder app that notifies you to take short breaks after a set interval of time while working on PC. The app is very useful for all those who spend continuous hours sitting on computer. Looking at computer screen for long hours irritate our eyes and make us more tired. In spite of being well aware that we should take short breaks while working on computer, we get so occupied with the work that we actually don’t remember to do so. I Care Eye Care is such an app that lets you set break reminders to keep you notified of the same. Using this free Windows 8 Break Reminder app, you can easily set reminders that give notifications after a regular interval of time. The app also offers additional benefits like eye-soothing exercises, tips to protect and keep your eyes relaxed. Some interesting facts about eyes are also described under Titbits section of the app. I Care Eye Care is freely available in Tools category of Windows Store. You can search for the app in Windows Store using Win+Q key combination or view it directly in Windows Store by clicking on the link given at the end. Let’s see how this free Windows 8 Break Reminder app works. I Care Eye Care is a very easy to use app, yet an effective tool to protect your eyes from strain. To use this app, first install it on your system. As you launch this app, you will see the Start screen of the app displaying a brief introduction and four buttons: Timer, Exercises, Tips, and Titbits. Click on Timer button to set break reminder. Select the break time interval using the drop down. You can also choose sound for timer and turn the timer On or Off. The related instructions will also be displayed along on the screen. You timer is set! The back arrow button will take you back to the main screen. Exercises category of the app describes four eye exercises that are helpful in reducing eye strain. Tips category of the app offers useful tips to protect eyes while Titbits category discloses some interesting facts about eyes. Also check some other free Windows 8 break reminder apps and some Yoga apps we covered earlier. 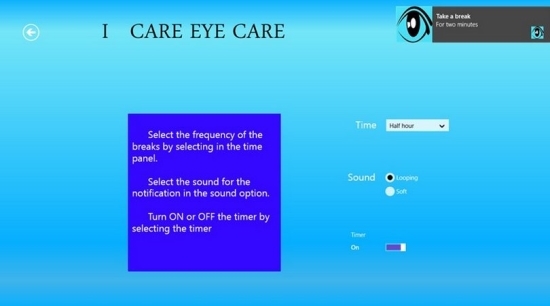 I Care Eye Care is a nice Break Reminder app that notifies you to take timely breaks while working on computer for long hours. 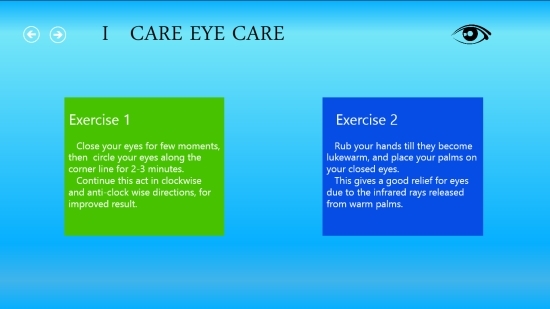 Eye care exercise and tips offer additional advantage. Try the app and keep your eyes healthy and strain free. Do share your feedback via comments. 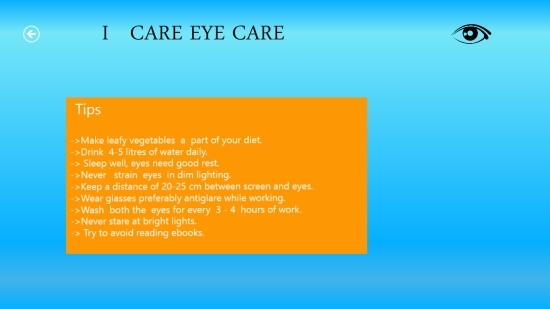 Get I Care Eye Care here!